(VII) Final approval of manuscript: All authors. Correspondence to: Ellen Frydenberg. C/O suite 712 St Vincents Clinic, 438 Victoria Street, Darlinghurst, NSW 2010, Australia. Background: Atlantoaxial (C1-C2) osteoarthritis (AAOA) causes severe suboccipital pain exacerbated by lateral rotation. The pain is usually progressive and resistant to conservative therapy. Posterior fusion surgery is performed to stabilise the C1-C2 segment. This is the first Australian study reporting the outcome of posterior atlantoaxial fixation including hybrid fixations performed for AAOA. Methods: All patients who underwent posterior atlantoaxial fixation surgery for AAOA from 2005 to 2015 at our institutions were enrolled (N=23). Patient demographics and surgical technique were recorded. These techniques included transarticular screw (TAS) fixation using image guidance with iliac crest bone graft and supplemental posterior Sonntag wiring, or C1-C2 lateral mass fixation (Harms technique). Some patients required a combination of fixation due to anatomical variation. Primary outcome measures including patient satisfaction, pain, disability scores and range of motion were recorded for all patients pre- and post-operatively. Post-operative assessment was supplemented with CT and X-ray imaging. Results: Twenty-three patients (19 women, 4 males, mean age 71.8±6.3 years) underwent surgical fixation. Eight underwent TAS fixation, 8 had Harms fixation, and 7 had a hybrid fixation. All patients reported statistically significant improvement in pain scores [Visual Analogue Scale (VAS) 9.4 pre-op compared to 2.9 post-op, P<0.005]. Disability scores [Neck Disability Index (NDI)] were statistically significantly reduced from 72.2±12.9 pre-operatively to 18.9±11.9 post-operatively, P<0.005. Mean follow-up was 55.3±36.1 months. Results did not vary according to the construct type. Ninety-five point five percent of patients showed radiographic evidence of fusion. 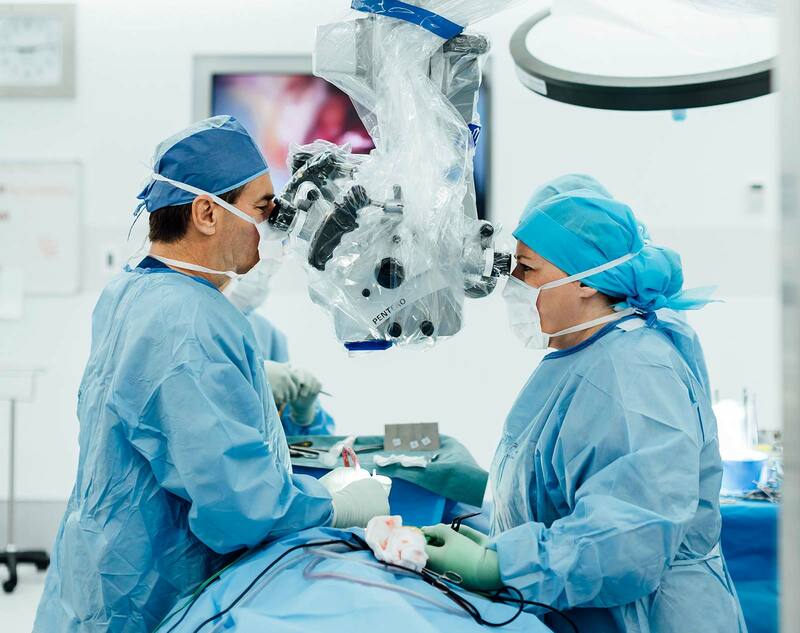 Ninety-one percent of patients said they would undergo the surgery again. Conclusions: Posterior atlantoaxial fixation with TAS and Harms constructs are highly effective for the surgical treatment of intractable neck pain secondary to atlantoaxial lateral mass osteoarthritis (AAOA). Surgery offers a high rate of symptom relief. If anatomical variability exists, both transarticular and pedicle screw fixation could be safely used in the same patient. Submitted Sep 08, 2018. Accepted for publication Nov 30, 2018. D. The repeated scans at the 5-year follow-up shows no recurrence and complete tumor resection. The closeness of the internal cerebral vein and vein of Galen to the tumor should be noted. These veins remain obvious postoperatively. There is evidence of decompression of the ventricles and cerebral aqueduct. Radiological osteoarthritic degeneration (OA) of the subaxial cervical spine is ubiquitous as patients age. It is usually asymptomatic, and rarely requires intervention. Symptomatic osteoarthritis of the atlantoaxial (C1-C2) facet joint (AAOA) is rare, affecting only 4% of patients with generalised OA (1). The unique anatomy of the atlantoaxial articulation, i.e., lacking an intervertebral disc, leads to a distinct clinical syndrome resulting from the joint degeneration—unilateral suboccipital pain on the pathological side exacerbated by lateral rotation (2) (Figure 1). It leads to reduced range of movement. It can be associated with suboccipital neuralgia due to local muscle spasm irritating the suboccipital nerve. While conservative treatment should always be attempted, intractable pain often culminates in surgical intervention to fuse the C1-C2 articulation. The first report of C1-C2 fusion was in 1939 using posterior wiring (3). 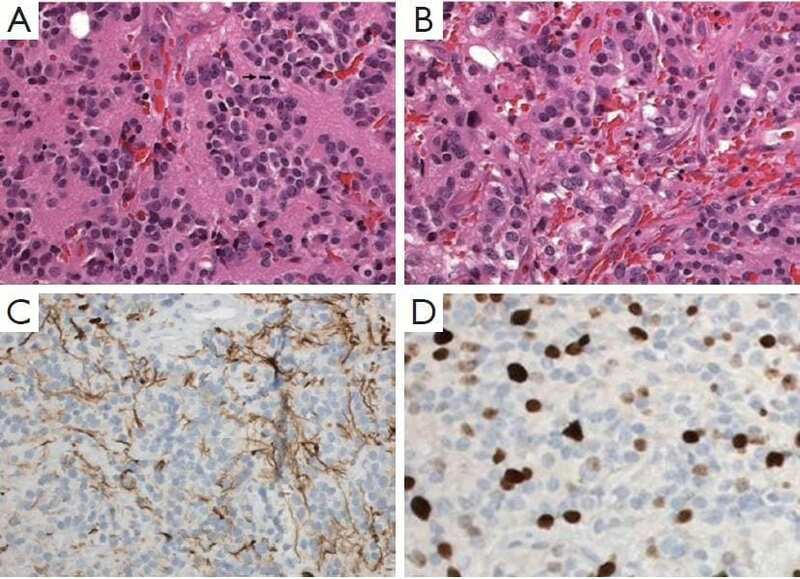 The histological studies revealed a moderate cellular tumor composed of small cells with round and generally uniform nuclei, fine chromatin, and small nucleoli. A few foci of cells with mild nuclear atypia were also found. Mitotic figures were rare (fewer than one per ten high-power field). Small pineocytomatous rosettes were focally found. Extensive hemorrhaging occurred in the adjacent granulation tissue, gliosis, and hemosiderin-laiden macrophages. The immunohistochemistry was positive for neurofilament, enolase, synaptophysin, and CD 56, but negative for NeuN . The Ki-67 proliferation index was 20% to 30% (Figure 2). The tumor was diagnosed as grade II PPTID based on the standards of World Health Organization (WHO). No evidence of recurrence was found from the annual followup MRI studies. The patient also remained asymptomatic at the 5-year follow-up (Figure 1). Pineal apoplexy, a poorly understood clinical syndrome, can be delineated as an acute neurologic deterioration caused by an abrupt expansion of a pineal lesion that is usually secondary to acute intratumoral hemorrhage1,2. The association of the pineal apoplectic hemorrhage with anticoagulant therapy and ventriculoperitoneal shunt placement has been reported, although the pathophysiology of the pineal apoplectic hemorrhage remains unclear3,5. 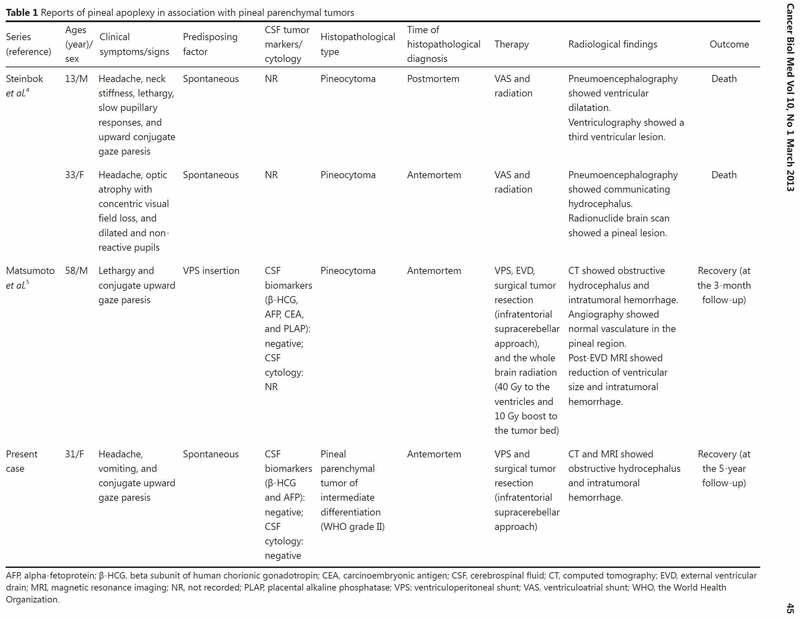 A review of literature only yields 3 cases of pineal apoplexy associated with pineal parenchymal tumors (PPTs) (Table 1)4,5. Headaches and gaze paresis are the most common clinical symptoms of the pineal apoplectic syndrome as reported in more than 74% of affected individuals2. Figure 2: Pineal parenchymal tumor of intermediate differentiation. D. Several Ki-67 labeled nuclei of tumor cells (400×). Nausea, vomiting, syncope, and ataxia are also found in more than 20% of the cases2. PPTIDs were first introduced as a distinct pathological entity of PPTs in the central nervous system neoplasms by WHO in 2007. These PPTIDs were designated as grade II (lowgrade; less than 6 mitoses and positive neurofilament stain) or III tumors (high-grade; greater than or equal to 6 mitoses and negative for neurofilament stain)6. PPTIDs are very rare tumors, comprising of less than 0.1% of all primary central nervous system neoplasms6. The estimated recurrences range from 26% (WHO grade II; median time to recurrence =5 years) to 56% (WHO grade III; mean time to recurrence =1.3 years), and the 5-year overall survival rates vary between 39% (WHO grade III) and 74% (WHO grade II)7. The discrepancy is mainly because of the rarity of this entity and the subsequent paucity of data to establish a clinically relevant grading criterion. The optimal treatment for this entity remains elusive. Surgical tumor resection is generally recommended as an initial treatment for PPTs of all grades, with limited evidence supporting the application of adjuvant chemotherapy and radiation therapy for localized and low-grade PPTs8. The precipitating factors of the initial pineal apoplexy in our patient could not be identified. Although known to be a safe and reliable procedure to obtain a histological diagnosis of pineal lesions8, stereotactic biopsy elicited a second pineal apoplexy that prompted an urgent surgical tumor resection. No adjuvant chemotherapy and radiation therapy were planned given the tumor grade and surgical microscopic and radiological evidence of the total tumor resection. In conclusion, characteristic pineal apoplectic symptomatology, either spontaneous or induced, is a rare event but requires an expeditious clinical response, notwithstanding the pathological entities and precipitating factors. 1. Burres KP, Hamilton RD. Pineal apoplexy. Neurosurgery 1979;4:264-268. 3. Apuzzo ML, Davey LM, Manuelidis EE. Pineal apoplexy associated with anticoagulant therapy. Case report. J Neurosurg 1976;45:223-226. 4. Steinbok P, Dolman CL, Kaan K. Pineocytomas presenting as subarachnoid hemorrhage. Report of two cases. J Neurosurg 1977;47:776-780. -case report. Neurol Med Chir (Tokyo) 1997;37:911-915. 6. Dahiya S, Perry A. Pineal tumors. Adv Anat Pathol 2010;17:419-427.
study of 76 cases. Int J Radiat Oncol Biol Phys 2000;46:959-968. 8. Konovalov AN, Pitskhelauri DI. Principles of treatment of the pineal region tumors. Surg Neurol 2003;59:250-268.